For those who are wondering, I have kind of gotten my parking woes straightened out. I say "kind of" because I do have a card that allows me access to the garage, but I still don't know how much they're charging me for the *$@! thing!! I may yet murder the lot of them. For one class we were told to take a picture of something in Baltimore and record a voice recording about what we thought about it. I posted the picture in front of the friend's house I often stay at (see above), showing the total lack of handicapped parking on the street. I then commented quite pointedly that Baltimore doesn't have handicapped parking on the street anywhere. Not even in front of the Veteran's Center. Not cool, y'all. As for lupus, I am realizing how very much the Benlysta has been helping me. Why, you ask, am I now realizing this? Quite simply because I am overdue for my next infusion, and so I'm reverting back to a pre-Benlysta state. Not good. All of the sudden the lining around my lungs is inflamed, every joint in my body is screaming, I'm covered with bruises and I keep getting lupus rashes. Nothing says "chic" like a bright red lupus mustache! I'm scheduled to meet with my doctor tomorrow, and if he doesn't have an immediate plan for giving me the drug I'm going to throw a major hissy fit. On a side note, my much-beloved doctor in Vermont recently punctured a lung, so for those so inclined, please offer prayers or thoughts of healing for him. He was my doctor for six years, and moved mountains to take care of me. Yow! Prayer sent up for him! One of my friends had that happen with a cortisone shot that went awry in the extreme--she did survive and heal, and hopefully he will too. 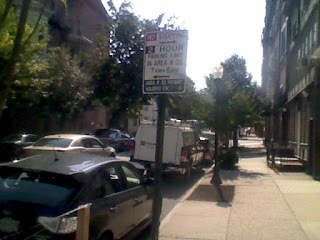 Baltimore is a very very old city, not designed for cars and I've never seen a handicapped spot on a city street but one once, and it was reserved for a resident in that building. Good luck, and I'm very glad you can park in that garage. Ahem. I courteously (and nervously) point out that I live in a very old city. Like just over 1200 years. There are in fact lots and lots of them. And we have parking spaces and handicapped spaces, no problem. It seems that my prayers are getting pretty long these days, but I'll include you, your Vermont doctor, and your Maryland doctor if he doesn't wise up and give you your next Benlysta treatment. I hope you can get the garage situation sorted out completely. It should be free, since if you didn't have lupus or anything equally stupid to deal with, you would be walking, if not running. I hope your doctor's recovering nicely by now. My friend Kaye went through that a few years ago and it was scary stuff.